Mechanically heavy-duty vehicle components such as tires are a permanent issue for quality control and research and development. 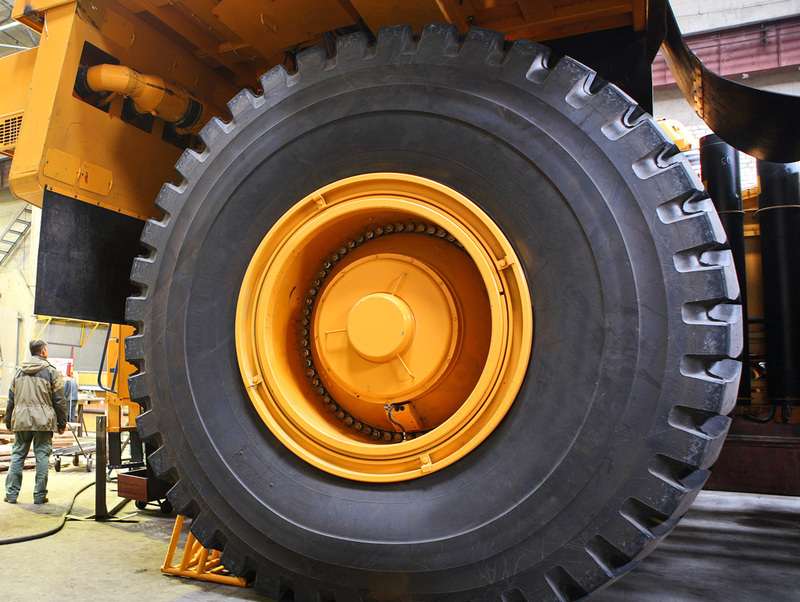 The tire manufacturer Bridgestone in Hofu (Yamaguchi Prefecture in southwestern Japan) has developed new test methods to meet the growing performance requirements of extremely large off-the-road tires for use in construction and mining vehicles. Huge dump trucks, such as the Komatsu 960E-1K, can transport more than 300 tons of mined rock. The strain on these 2-meter high tires is extremely high as they traverse rocky paths for several hours a day. The stress tests carried out at different production sites of Bridgestone consist of thermographic inspections of different layers of the tire. Numerous holes in the tire enable the control measures of the tire interior. Audits focus on the peripheral structures of the tire. To obtain the most accurate measurements at different speeds, a thermal imaging camera with an interface for precise external control is required. The high-end camera ImageIR® 8325 by InfraTec collects data with a thermal sensitivity of 20 mK, thanks to its high-precision triggering, very short integration times in the microsecond range and extremely high frame rates. Equipped with durable coolers with an average service life of exceeding 10,000 hours, monitoring processes are performed for extensive testing phases. 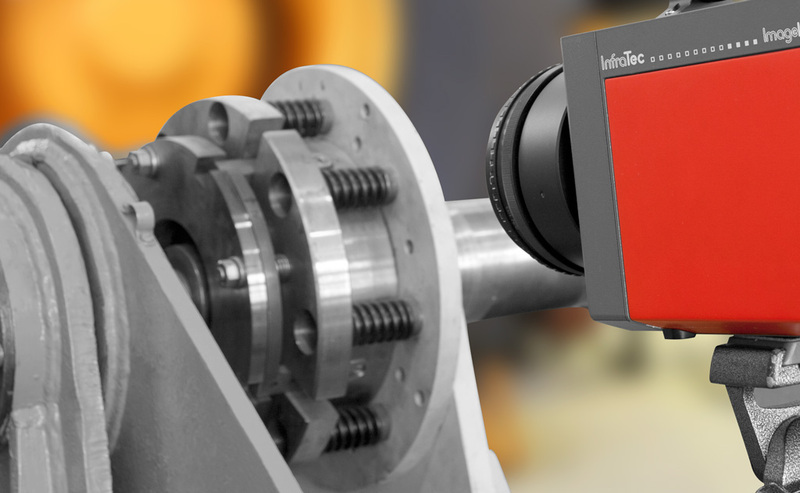 Due to the efficient use and excellent performance of low maintenance and stable ImageIR® cameras in their current test facility, Bridgestone is committed to using these instruments in the future as an integral part of other projects. InfraTec‘s Japanese partners for IR systems have developed a complete turnkey solution for long-term and automated test sequence with constant, exact thermography measurements. With the friendly support of Bridgestone; abbreviated text version. 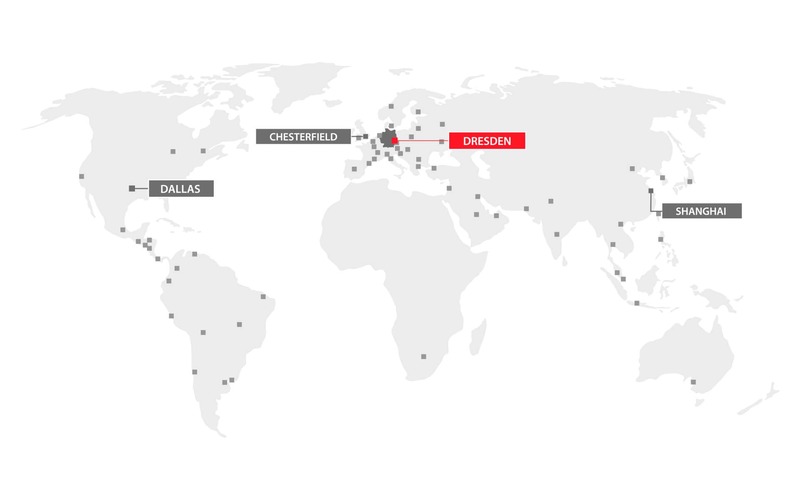 The Laser Zentrum Hannover e. V. is one of the world’s leading institutions in exploring new applications for lasers and their technological implementation. 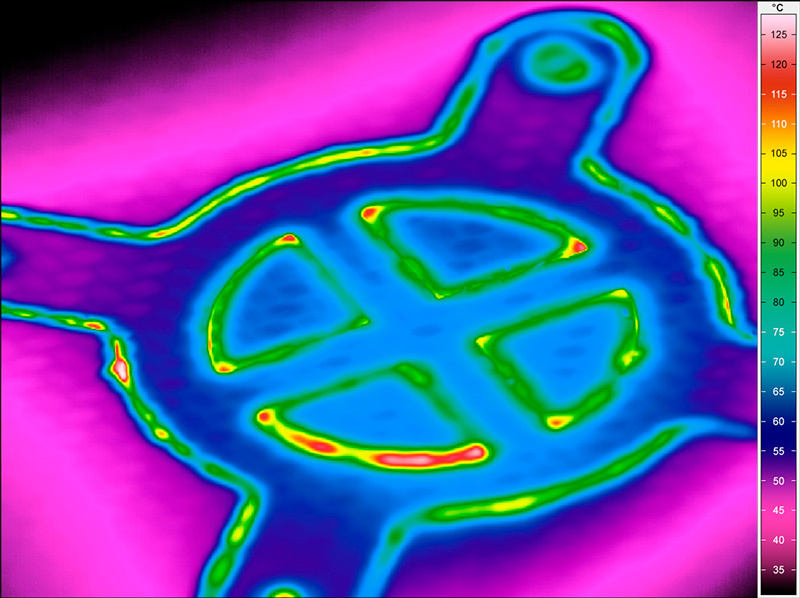 Since lasers often operate with high intensities, non-contact temperature measurement with thermography for the purpose of monitoring their application plays an important role. Laser beam cutting – and welding of carbon fiber reinforced composites (CFRP) requires a precisely-tuned energy input. Thus, although the carbon fibers are first cut at temperatures of over 3,000 °C, the plastic matrix of the composite materials will melt or vaporises at temperatures of only 130 °C. Due to the large differences in the thermo-physical properties of the components, a precise high-resolution temperature measurement is required. The short process times require a high measurement frequency – only then reliable statements can be made regarding thermal influences of the base material at the cut edges and feasible joint seams. For the measurement and evaluation of the various scenarios, the cooled thermal imaging camera ImageIR® 8300 is used. This camera, equipped with two separate filter wheels, allows the representation of spectral abnormalities in the CFRP laser processing. The high measurement accuracy of the relevant process temperatures of ± 1 % is achieved by the specially-developed precision calibration, the optimal use of the dynamic range of the infrared detector and, through the integration of several calibration curves for the necessary drift compensation, and thus for long-term stability. With the use of special lenses, the smallest details can be detected from a safe distance. The control of the camera and the storage and evaluation of measurement data is carried out completely with the thermography software IRBIS® 3.